March 14, 2018 at 12:09a.m. Babe Kwasniak remembers the last time he went head-to-head with an unheralded basketball team from Trumbull County. In 1993, Kwasniak and his Cleveland Villa Angela-St. Joseph’s teammates faced Girard in a regional final. He remembered that his team was pretty stacked, featuring future Washington Redskins linebacker London Fletcher and Brian Hocevar, a basketball commit for UNLV. As much he remembers their careers, he remembers that 78-57 loss to the Indians just as well. “I watched [Girard] in their semifinal and I thought if we played them 100 times — of course I was an idiot kid who was a junior in high school — we would beat them 100 times,” Kwasniak said. “I won three state championships in high school and that was the one year we didn’t get it. Now the head coach of his alma mater, Kwasniak will meet Lakeview on Thursday in the Canton Civic Center. 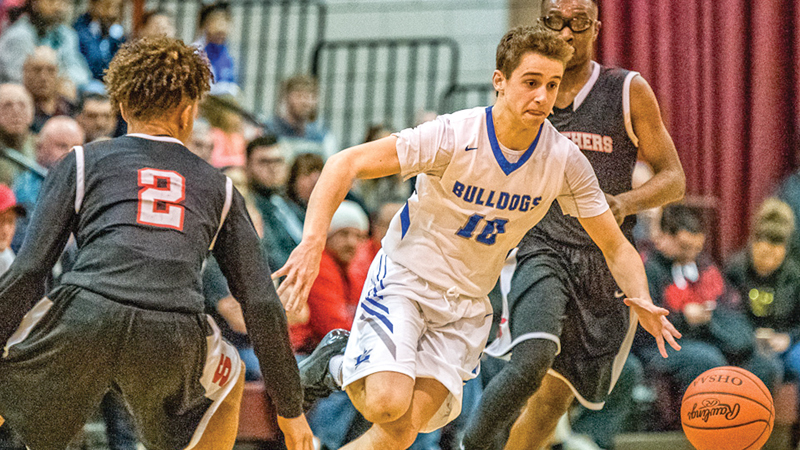 The Bulldogs — heading to regionals for the first time since 2001 — fit the bill of being an unexpected participant in the tournament. Lakeview (20-6) has come very using few players who share the ball. Munno, T.J. Lynch, A.J. McClellan and Daniel Evans each average around a dozen points a game and the Bulldogs seldom use their bench. “[VASJ] is going to pressure us and I really thought fatigue would be an issue against Poland and Struthers and the kids just really went out and gave all they had for 32 minutes,” Lakeview coach Ryan Fitch said. “We’ll be on a bigger floor, so fatigue is definitely a concern but we’ll see how we do. VASJ (17-6) is the reigning Division III state champion that moved up to Div. II because of competitive balance rules. The real change with this squad is its roster. The Vikings graduated six players and then another six transferred. “I’ll say this: the kids who stayed value winning. Obviously, we’ve won six district titles in a row and we’re coming off five straight state championship games. It was all for different reasons, but those kids obviously didn’t value winning,” Kwasniak said of the transfers. “They cared more about themselves and their own situations more than the team’s. Jenkins averages 22.8 points, 6.1 assists and 4.1 steals a game and has offers from Winthrop and Army as well as a few from schools at the Division III level. Lakeview and VASJ tipoff at 6:15 p.m. and the winner will play the winner of Akron St. Vincent-Saint Mary and Richfield Revere. “We’re just excited to be there and win or lose, my boys will give 110 percent effort and that’s all I can ask from them at any point, let alone in a regional semifinal,” Fitch said. March 10, 2016 12:09 a.m.